I wanted to see how effective a noise canceller could be in reducing the background noise floor when attic / stealth antennas are being used. I had a go at building the simple SEM QRM eliminator circuit to see if that could work  and it does (sort of). With a simple noise antenna I can get a 30dB null on a spurious signal from the home burglar alarm control panel. But these all tend to use RC bridges, which seem to suffer from large amplitude variations when adjusted. This makes re-setting them each time you move frequency very time consuming. The design shown below from G4WMX is a Null Steerer which is also similar, but uses tuned circuits to obtain a greater phase shift. A more sophisticated design can be found here. Whilst playing with the CR networks and looking at the phase and amplitude variation with a VNA. I the 0/180 fed CR network produces a rapid phase flip at the corner frequency. However it also produces a smaller phase variation at other frequencies. Which are not so rapid or of such a large phase shift. I think this is the part of the characteristic that the simple circuits use. However the amplitude variation is fairly huge. This design by PA0SIM http://www.pa0sim.nl/Phaser%2080%20-%2010%20meters.htm partially solves this problem buy using a differential capacitor and balanced RC phase shift networks. The DXE NCC-1 seems to use a lot of broadband transformers with what appear to be light dependent resistor opto-couplers mounted nearby on the PCB. 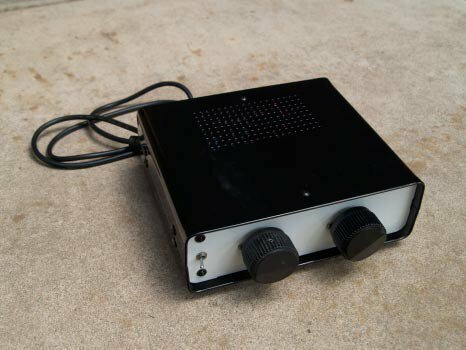 (See photo with small black tubes marked 177 in white letters probably something like this device made by Silonix ). I initially thought that they may be using 90 degree hybrids. But these wouldn't work over several octaves .So quite how this works is a mystery to me; however the phase control is a potentiometer. So it's got to use varicaps, pin diodes and the LDR / opto-coupler or similar in some way. I was thinking of using cascaded CR networks with some form of 'ganged' variable resistance element (PIN diode or LDR/LED combo). So that each stage is only required to produce a small shift. With a similarly small change in amplitude. It may also be possible to use a similar PIN diode (or whatever) tracking attenuator to correct for this. A recent design in Sprat uses a LC network but this would require band switching to cover the required frequency range. However after doing some research and fiddling about I have now built a slightly better version of the X-Phase. This doesn't attenuate the direct antenna feed and doesn't add intermod products like the QRM eliminator (I also got one of the originals from the flea market at FRARS). 1. The phase shift circuits do not provide a full 180 / 360 degree shift. So you cant always achieve a null. I suspect this is also why folks seem to have several noise antennas which they select to achieve the best results. By swapping antennas you may be able get a more suitable phase relationship, which is within the null range of the circuit. 2. The phase shift circuit introduces large amplitude variations (10 to 20dB or more) as it is adjusted across its range. This means that you have three controls which all interact quite badly with each other making it a nightmare to setup quickly. 3. Most units dont have a control which allows you to mute each antenna in turn so that you can compare the amplitude and signal quality of the wanted and noise signals. Having this feature really speeds up alignment. Some time ago I posted a note on some forums about this topic and got a reply from Chris Trask, N7ZWY / WDX3HLB, a professional RF designer. 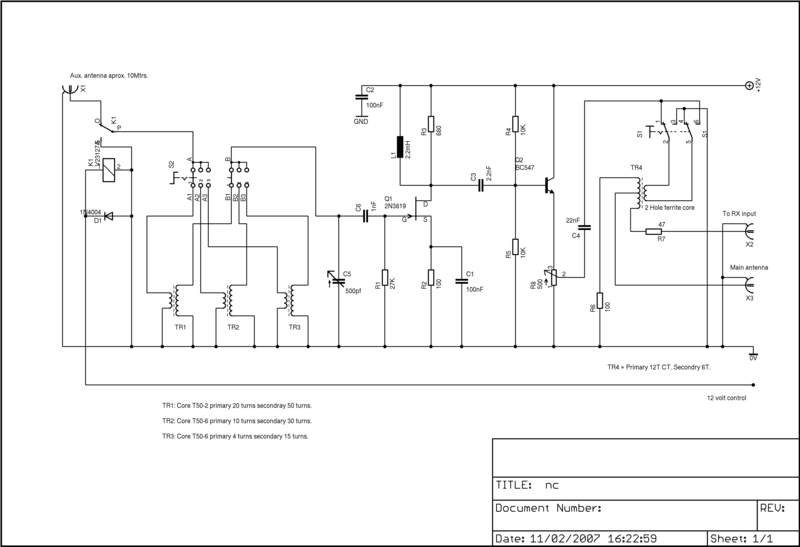 He has sent me a circuit and (revised component values for a wider operating frequency range) of a unit he built some time ago. It uses vector synthesis, and only has two controls, phase and amplitude. As these dont interact with each other you only need to setup the amplitude and then adjust the phase to achieve a null. Q - I'm assuming that the bias network at the input stage is purely to feed external active antennas ? Q - The wideband amplifier design you have used - what turns ratios are used for the transformers, or is the design documented elsewhere ? A - The feedback transformer is 1:2:2 and the augmentation transformer is 1:2. Q - Can the transformers T5, T6, and T7 be wound on the same dual hole baluns cores as the other ones ? A - They aren't all that special, but somewhat better than using 2N2222/2N2907. I originally used MPS6521/23, but sadly those are no longer available. Its a shame, as they were ideal for HF and lower frequencies. Q - What is the purpose of the second part of the ganged pot R1B. Are the connections at both ends shown correctly ? A - Yes the conections are correct. The phase control provided by R1A results in a gain change of about -2dB at the centre, so R1B corrects this to less than -0.5dB. Q - My intention was to use hybrids to provide the required phase shift. But these will only work over a limited octave range. It looks like your method offers a much greater operating frequency range. I'd hope to be able to possibly cover 1.8 to 50MHz in two switched ranges. So it looks like the way to go is to add a third section to the phase shift networks to get basic 1.5 to 30MHz coverage in one range. With the option to add 50 & 70MHz as another switched range. If I wish to add a third stage, is it just a simple matter of duplicating the right hand most section of each network, or is it more complicated than that ? A - The values are quite different. I just ran the DOS programme to see what it would take, and you'll get a pretty nice phase ripple over 1.5-50MHz by adding another section to each shifter. It might be a bit trickier to align, which requires a signal generator, a scope, and a pair of matched probes. I can determine the parts values for you. Q - For 50 & 70MHz would it just be a question of scaling the existing values appropriately ? Q- Are both sections of each individual coil assembly wound with the same number of turns on the same former - it's hard to tell from the photo in the document ? A - No, they're all different as you can only adjust them so far. You have to experiment with whatever coil form you use to determine how many turns for each coil. Q - You specify coil inductance- is this for just 1 of the bifilar windings or is it total coil inductance.? http://www.lodestonepacific.com/products/vscf/pg10.html Cambion and Amidon also have similar items. Q - Also have you any more information WRT coil construction. I'm happy to experiment, but some guidance e.g. approx. number of turns (or ratio) for each set of windings. Are the windings bifilar wound or separately coupled via the adjustable ferrite core(s). A - None really. It depends on what coil form you use. Bifilar windings are mandatory so as to get the proper centre tap. Amidon has shielded adjustable coil forms that are ideal. You can add a third section to each phase shifter and get it to work 1.5-30MHz. To do the 1.5-50MHz you'd be better off using two ranges (two sections each shifter) as it will likely take 5 sections in each shifter to get that range. Here are the schematics for 5-pole and 6-pole input sections. You align these things by setting the generator at the frequency above each section, measuring the signal at the input and output of each section, then adjusting the inductor so that the two signals at 90º apart. There is always a little interaction so you should do each phase shifter at least twice. The upper one and middle one should be 0º apart. There is a technique to aligning those phase shifters which is quite simple, requiring a signal generator and oscilloscope (or phase/gain meter or vector voltmeter). MHz I appreciate it may be a little more difficult to tune. A - My notes says that it's good for 0.5-30MHz. Q - I would like to cover 4 to 30 MHz or even up to 50 if feasible  would your 6 pole design be the best for this frequency range? A - The 4-pole version can easily handle a decade (ie - 3-30 MHz), but may prove difficult to handle 50 MHz due to the losses in the ferrite cores. You would need to remove the ferrite slugs from the adjustable forms and replace them with powdered iron. For 3-30 MHz just adjust the capacitor and inductor values by 0.8165. To do 4-50 MHz you would need a 6-pole phase shifter. Q - Is L11 actually tuned to 110 MHz ? I must admit that I still haven't got very far with this project. I've got distracted by far too many other ideas. It took me a while to get hold of some suitable TOKO style coil formers, but I finally got some from Spectrum Communications. This is more of a winter project as it will take a while to complete, but I hope the end results will be worth it. They will need some alignment and testing before I start on the rest of it.